Ideal for surface area and mesopore analysis, the iQ-AG is available in up to three-station versions and provides an easy upgrade path to high vacuum, low pressure and chemisorption capabilities should your needs change. Usable with nitrogen, argon, carbon dioxide and a host of other gases (including ammonia), this instrument has instant appeal for a wide range of applications. The standard features that it shares with the other models makes this physisorption analyzer stand out from the crowd... these include low leak-rate metal seals, stainless steel manifold, dedicated Po transducer, built-in programmable degassing, multiple gas inputs, 3 liter analysis dewar, and full version software. These chemisorption models have the necessary additional features for characterizing catalysts using flow methods of preparation and static isotherm measurements, yet retain all of the physisorption abilities of the standard versions. A second and even a third physisorption station can be added. 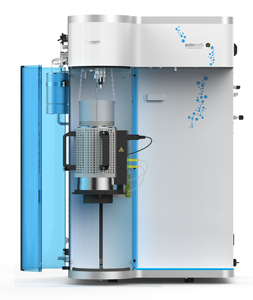 The physisorption-only micropore model feature a high vacuum system and low pressure transducers for high-quality, detailed micropore studies. They are available with up to three micropore analysis stations. Each "MP" analysis station is equipped with its own dedicated set of pressure transducers: 1 torr, 10 torr, 1000 torr. It can be upgraded to the Chemi version.